If your business offers a 401(k) plan, you already know there are financial benefits to both the owner and participating employees. But the individuals who serve as plan fiduciaries may not be aware of their specific responsibilities and obligations in managing and administering the plan. 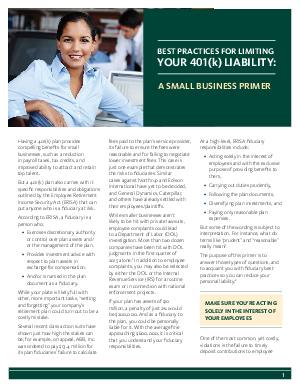 This small business primer provides best practices that can help fiduciaries reduce their personal liability, avoid costly violations and make sure they’re meeting ERISA compliance requirements.